NEW YORK (AFP) - The spring art auction season kicks off Sunday in New York with paintings by Jean-Michel Basquiat and Cy Twombly and a taboo-smashing statue of Hitler. Some 1,500 artworks are to go under the gavel over the course of five days of auctions expected to fetch more than $1 billion. The most important ones will be held in the evening, with three hosted by Christie’s and two by Sotheby’s. First comes Christie’s thematic evening “Bound to Fail,” with a selection of 39 works of modern and contemporary art exploring the idea of commercial failure and taking risks to expand the boundaries of art. From behind, it looks like a boy on his knees, wearing a gray woolen suit. But walk around front and you see it is Hitler, his hands clasped together in front of him as he gazes upward. Completed in 2001, it is expected to go for $10-15 million. “I wanted to destroy it myself. I changed my mind a thousand times, every day,” said Cattelan. Even some years ago the statue would have been a tough piece to sell, but now the market seems ready, he said. The piece might break the previous $8 million record for a Cattelan piece. Another important work in this particular auction is “One Ball Total Equilibrium Tank” by the American Jeff Koons, who is known for toying with objects from popular culture. This one has a water-filled basketball suspended in the center of a tank of saline solution. It is expected to lure as much as $12 million. On May 9, French artists Maurice de Vlaminck and Andre Derain will be the main features of an auction of impressionist and modern art by Sotheby’s. Derain’s “Les voiles rouges,” completed in 1906, is thought to be worth $15-20 million, and “Sous-bois” (1905) by Vlaminck some 12-18 million. These two painters represented Fauvism, a short-lived movement from the early 20th century that broke with Impressionism and used bold brush strokes and bright colors. These two paintings have never been auctioned before. Also available at this auction is an exceptionally rare Rodin marble sculpture of embracing lovers, valued at 8 million to $12 million. Conceived in 1884 and carved in 1901-02 from one block, Sotheby's has said it expected “Eternel Printemps” to set a new record for a Rodin sculpture in marble. It also said it was the first time that a sculpture in this medium and of this subject -- for which the French artist is perhaps most famous -- comes under the hammer in more than two decades. On May 10 a large painting by Basquiat will be the highlight of Christie’s auction of post-war and contemporary art. The price estimate is $40 million, not far from the record for a Basquiat piece, which is $48.8 million for “Dustheads” in 2013. Standing 2.30 meters tall and 5 meters wide, the untitled painting‘s center depicts a sort of self-portrait in the form of a mask, showing the late Haitian-born artist’s fascination with funerary art. Sotheby's will serve up two paintings by the Expressionist Twombly on May 11. The first of them, from 1968, is part of his “Tableaux” series depicting curvy, squiggly lines on a drab background. It is valued at more than $40 million. 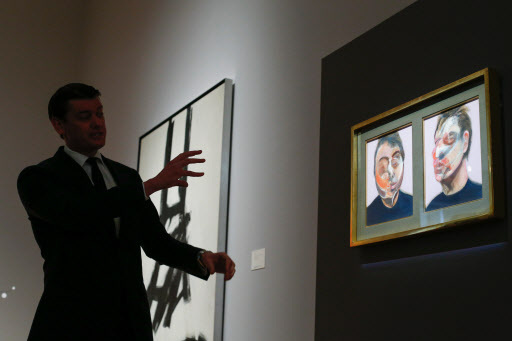 Another painting from the same series went for $70.5 million last autumn at a Sotheby’s auction. That was a record for works by Twombly, who died in 2011. The second, “Untitled (Bacchus 1st Version V),” is valued at more than $20 million. That same evening Sotheby's will auction off “deux Etudes pour un auto-portrait” by Francis Bacon (1970). 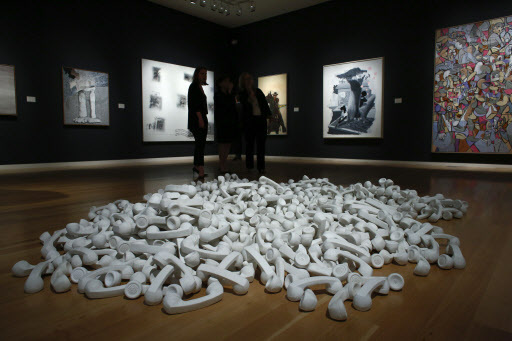 It has only been exhibited twice, in 1971 and 1993, and its estimated value is $22-30 million. The last evening of Christie’s auctions on May 12 will be dedicated to Impressionist and Modern art and feature some 50 works including a Modigliani valued at $12-18 million.